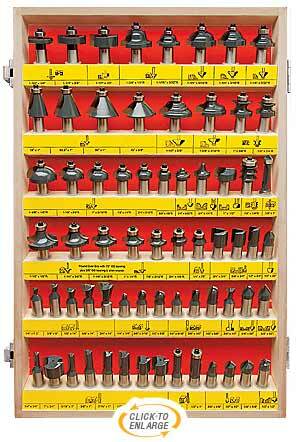 66 carbide tipped router bits in a "wall mountable" Wood Storage Box. Excellent quality Carbide Tipped, anti-kickback router bits (larger sizes) with a high temperature coating. The largest, most inclusive carbide tipped router bit set we've ever offered at an amazingly low price. The 66 high quality router bits in this set will handle a vast number of project applications. Available in 1/4" and 1/2" shank. Includes a wood storage box. My wife bought me this set a few years back for CHRISTMAS! One of the BEST presents ever in my woodworking life. Totally recommend these router bits, used them a lot on my last house and plan on using them even more now that I’m retired. I'm just an amateur/hobbyist woodworker so I can't speak from a professional's point of view. That being said, this set works great for all of my home projects. Both in my hand-held router and in the router table, they make nice clean profiles. The 1/2 shank is beefy and well balanced. Besides this set, I have only had to buy one other bit (a 2" flush trim) and can always find a bit to meet my needs. So, if you are on the fence, I say get this set and you won't regret it. But sadly, the next time you look through a bit catalog you will be saying, "I already have that bit...and that bit...and that bit" and you won't need to order anything new! I am an experienced amateur woodworker (for over 40 years), and I have a fairly complete woodworking shop. I have an array of routers and bits from Freud, Bosch, Wood River, MCLS, and a few other vendors. But although I already had a fairly extensive set of 1/2" and 1/4" bits, I was still missing a few fairly common 1/2" shank bits which I wanted to buy. I had actually planned to buy them for myself as a "Christmas present from me," but shopping on-line, when I totaled up the cost I started looking for a less expensive alternative. I spotted this set on Amazon and then went to the MLCS site to get more information. Now I already had some other MLCS bits and have found them to be very good quality for the money. So after thinking it over for a few days, since they were guaranteed I decided to get them, AND I AM VERY GLAD I DID. First off they arrived in mint condition, and I will be mounting the case to a wall in my shop (but with something to support them from below as well - the case really is nice, but it's also heavy and I'm not sure I trust it with that much weight). So far I have "played with" and have done test cuts with 14 of them, and I have not had a single problem (more below). I have also visually examined the edges of ALL 66 bits with a jeweler's loupe and if there is a nick or bad spot on any of those I haven't tried yet, I can neither see nor feel it. Naturally I first cleaned each bit to remove any grease or contaminants from the bit. I did my "playing" and routing on a router table using a 2.25 HP Freud router motor (can't afford the 3.5 hp router at this point) and ran all of the tests first on douglas fir, then on poplar, then on "waste pieces" of cherry, purple-heart, and 120-year-old hickory. I got NO tearing or overheating/scorching/burning on any of the cuts and and the surfaces are very smooth (so far anyway - 52 bits left to test). Of course - particularly on the harder woods - I started out with shallow cuts and moved to the full depth of cut in multiple steps (more steps for the hickory and purple-heart of course). All of the cuts were clean with no burning, no tearing, and no splintering - and overall I was very impressed. For comparison I called a friend whom I knew had several new Freud bits and I took my set to his shop and we did a side-by-side comparison of several (same type/size) of the Freud and MLCS bits. While the edge went to the Freud in a couple of cases, overall the difference was extremely slight. For example in using the 1/2" radius round-over bit, doing the cut in 4 passes on purpleheart, neither bit caused any tear-out and there was no overheating/singing/burning. However, to be 100% honest the surface quality from the Freud was better - but only very slightly. Using a "kleenex" test suggested to me by a much older woodworker who made his living designing and building high-end custom cabinets and furniture, I used a single thickness of kleenex (the cheapest grade) and wrapped that around my index finger. Then I ran that finger+kleenex down the roundover cut AGAINST the grain. While the two felt almost identical, the surface from the Freud bit did not "catch" anywhere on the surface of the cut, while in 2 spots it did on the surface from the MLCS bit. After a slight touch-up with 600 grit sandpaper the MLCS (3 LIGHT strokes with the sandpaper taking < a minute) there was no difference that I could detect. Because I don't know how these bits will hold up over time, I can't speak to that matter yet. But I DO have a "bullnose" (bowl and tray) bit from MLCS which is (IIRC) 1-1/8" in diameter (the one with the bearing for deeper cuts). With it I have made roughly 6 dozen (4" to 10") bowls and trays in walnut, hickory, oak, and purpleheart and it still cuts cleanly with no tearouts or burning/overheating. So if these bits hold up as well as that one, I'll be very happy. To sum it up, these are an excellent value for the money, and unless you are a full-time professional (in which case you already have the equivalent bits probably from a higher-priced manufacturer) I would recommend them if you are looking for a good set of 1/2" shank bits. Purchased this set about 9 months back. Arrived in a nice storage box, which was of no value to me since I have my router bits openly arranged next to my router tables. I use the MLCS router bits exclusively on cabinet grade hard woods. Right out of the box, after a good cleaning, about half the bits cut perfectly and have maintained sharpness. The other half were dull beyond help. With some exception, I default to an old set of Skil router bits for cuts that have to perfect. That's right Skil. The MLCS router bits that have a decent edge I use sparingly. Many of you liked the ability to return the bad bits. I don't get outside and returning any product is difficult. I want my purchases to be of stated quality out of the box. One of the rows/ledge that holds the bits was split in half. I should be able to glue and use finishing nails to fix the box. Called and told company after I looked at bits which I determined to be outstanding I had a bit that had a burr in it they sent me a new bit if you want someone that respects your input and will not screw you they HONOR their product. AND YOU TALK TO REAL PEOPLE. DO NOT SPELL GREAT BUT MAKE THINGS NO ONE CAN MAKE TRUST ME THESE PEOPLE WILL TREAT YOU LIKE REAL PEOPLE. I received this as an early Father's Day gift. It took less than two weeks to use over half of the bits in the set. I will say that perhaps I overestimated the strength of the 1/4 straight bit. At a depth of approx 3/32 in white oak it hit something in the wood and disappeared. I called the help line and the service was/is top notch! After I explained what had happened, she sent me a replacement within a day! I knew I loved this company for a reason. The other bits are preforming wonderfully! Smooth, even cuts all the way through. EXCELLENT SET. JUST ABOUT EVERY BIT I'VE NEEDED. HAD MY SET OVER TEN YEARS SO OLD BOX BUT I OPTED TO REMOVE LID OFF OF BOX. BOX/BITS FIT NICELY IN ONE OF THE SHALLOW DRAWERS OF ONE OF MY STEEL CABINETS. I LIKE TO SECURE MY VALUED TOOLS WHEN I'M AWAY FROM MY SHOP. IT LOOKS LIKE NEITHER THE BITS OR PRICE HAVE CHANGED OVER THE YEARS AND THAT IS REMARKABLE. MY ONLY CRITICISM, I WOULD LABEL THE BIT TYPE AS WELL AS SIZE ON THE BOX LABEL FOR CLARITY. Nice set and selection. Have used several on recent projects. Only negative: I was routing a coin slot in 3/4" oak, making several passes, using the 1/4" straight bit, and it snapped of just below the shank. I was moving fairly slowly, but obviously not slow enough. MLCS NOTE: We are replacing this broken bit in accordance with our Satisfaction Guarantee. We do recommend a depth of cut of about 1/8" per pass when using a 1/4" D straight bit. I purchased the set to replace my cheaper and less expensive bits. I was instantly surprised by the cleanness of the cuts as well as two woodworking friends who purchased their own sets. (I don’t share router bits!) The set has met all of my cabinet and custom project needs and continues to perform perfectly. No burning, tear-out or frayed edges. I highly recommend this set to anyone whether a beginner or seasoned professional. I've had this set for about 10 years. Excellent quality, worth way more than the price. I like having nearly any common bit I might need so I can continue a project without stopping to buy a bit. I've never had any tear-out with these bits. No issues with bearings coming loose as I have heard about other brands. The bits are sharp and have heavy carbide, lasting a very long time. My only complaint is the set I bought way back then came in a horizontal box, not wall-mountable like this set. I'm jealous of all of you that get this new style box, but at least I have the great bits and I'm very happy with them. Will continue to do business with MLCS. 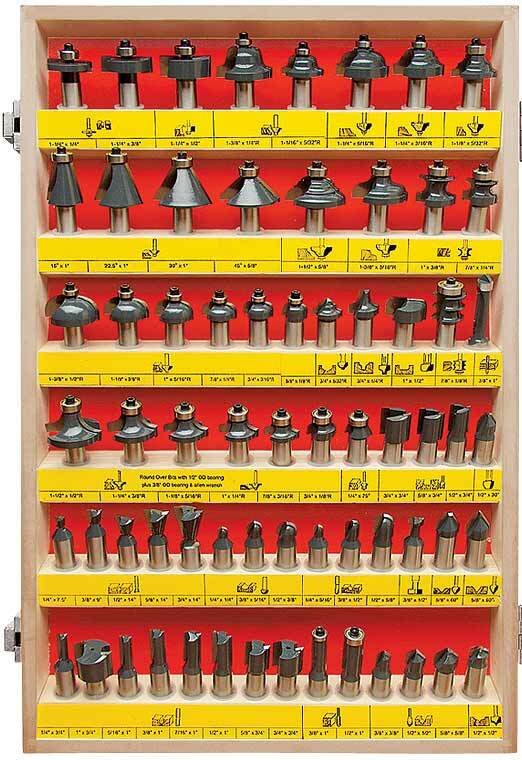 I spent a lot of time shopping for an excellent quality general assortment of 1/2 inch router bits before ordering the MLCS 66 piece set. I'm thrilled with both its quality and value, and I find this selecting of bits to be quite comprehensive. I'm pleased to find that these bits do not share many of the negative earmarks typically associated with other cheap imports. I highly recommend this set to anyone serious about router woodworking (and I don't find the case's hinges to be much of a problem!). Mine just came in, so long term review of the set itself for me is impossible. BUT, I do have experience with MLCS bits in the past, and they have been first rate all the way. I was surprised to see the boxed bits like this coated in the same wax protectant that the individual bits come in. Like the individual bits, the carbide is nice and sharp, and quite thick. I have bits from several MFGs, MLCS are my favorites. I have never had a burn, or fuzzy cut with an MLCS bit. Speaking of the box, locking rabbets for joints seem good and strong, the finish is good, but the hardware is hysterically bad. I fully expect I will have to go grab different hinges and latches before too long. I know they had to cut a corner here and there to keep the prices low, which would explain the hardware selection, but I WILL upgrade mine ASAP. Wall mounting is made easy by the keyholes in the back of the case. Mine will go on my shop wall closest to my table saw as the router is mounted in a table saw wing table. Great bits. I bought the 1/2" set and really like the selection and quality. Only disappointment is the quality of the latches on the case. They are flismly. I purchased this "1/2" 66 Piece Router Bit Set a few years ago while living in NY. I now live in NC and doing a lot of woodworking. This set is the workhorse of my workshop. I like the nice clean cuts it makes compared to other brands I've used. Never had any problem with this set at all. The quality of the bits are extremely first class. I highly recommend this set to all woodworkers at all levels. To good of a deal to pass up at this price. This is a super set at a great price! I am very happy with the selection and variety of bits included in this set. I have not used all of them, but the ones I have used have worked extremely well. I am very happy with this purchase! 2 defferent mail order companies. The carbide on the MLCS set was twice as thick as the competitors and the shanks were longer on the MLCS bits . The price on all 3 sets were about the same . Had this set for several years and have no complaints. I've not used them all as yet, but so far great.